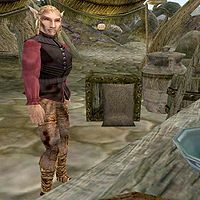 Elegal is a Bosmer trader who owns a stall in Sadrith Mora, near the slave pods under the large spiraling branch. He sells a wide variety of goods and clutter to all visitors. "Oh, Brallion went into Fara's for a drink. You should be able to find him in there." This page was last modified on 7 February 2018, at 00:22.